Forty days after Jesus was born, Mary and Joseph brought him to Jerusalem, to the temple to be dedicated to the Lord (Luke 2:22-24). This was standard practice for all firstborn children, according to the Law of Moses. There was nothing unusual about what they were doing … except for what happened next. It is as this point in his narrative that Luke introduces us to Simeon, and in a very significant way — with the word Behold. In the Bible, “behold” is a word that focuses our attention and calls us to see something of importance. Others in the temple that day might not have noticed what happened next, but Luke does not want us to miss it. Simeon was a man of no special prominence in Jerusalem. Neither a priest, nor a politician, nor a religious leader. But he was a man who had received a very special promise from God, revealed to him by the Holy Spirit: Before he died, Simeon would lay his yes on God’s Messiah. 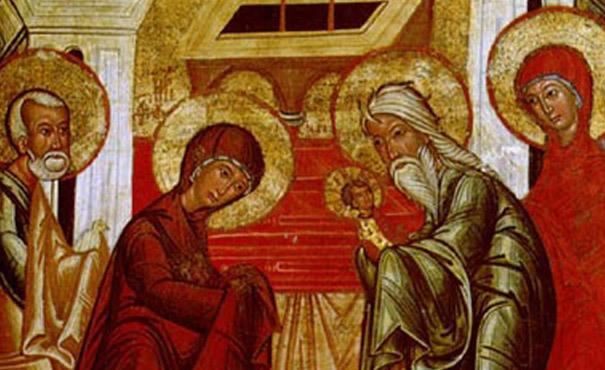 Now, on the very same day that Mary and Joseph brought Jesus into the temple, the Holy Spirit led Simeon in also. “By the Spirit” is how Luke puts it. We do not know exactly how it was, whether it was a conscious revelation or merely a prompting in Simeon’s spirit, to which he had learned to be obedient. However it happened, the Spirit of God got him there at precisely the right place and precisely the right time. Now, coming into the temple at that same moment was a very elderly prophetess named Anna. She had been a widow for about 84 years and had spent her life fasting and praying, night and day, in the temple courts (vv.36-37).Perhaps she had seen Simeon before. Perhaps they had spoken about the promise he had received. Or perhaps it was a life spent in prayer which sharpened her senses so that, when she saw Simeon with Mary and Joseph and Jesus, she immediately understood what was happening. Though Luke does not say, there is no reason to doubt that she, too, was led in by the Spirit. Recognizing the presence of Jesus, Her response was simple, but significant. “She gave thanks to the Lord, and spoke of Him to all those who looked for redemption in Jerusalem” (v. 38). You see, like Simeon, Anna had an expectation that the Anointed One would soon come and God’s promise would be fulfilled. And they were not the only ones. There were others also who had such an expectation and “looked for redemption in Jerusalem.” Anna sought them out and shared the good news with them. Of course, Anna and Simeon were old and would not get to see Jesus move through the stages in His life. They would not witness the cross or see His in resurrection. No matter. They had learned to hear the voice of God and to be led by the Spirit. They had learned to live in expectation of the promise of God. They had learned to behold, and to understand what they were seeing. They had seen enough to know that God’s kingdom purpose in Israel would be fulfilled and all the world would be blessed by it. It was now beginning before their eyes. Two thousand years later, we have still not yet seen the full manifestation God’s kingdom in the world, the will of God being done thoroughly and completely on earth as it is in heaven. But it has begun and is increasing every day. Jesus said, “From the days of John the Baptist until now, the kingdom of heaven has been forcefully advancing and forceful men lay hold of it” (Matthew 11:12 NIV). “The law and the prophets were until John. Since that time the kingdom of God has been preached, and everyone is pressing into it” (Luke 16:16). The apostle John put it like this: “The darkness is passing away, and the true light is already shining” (1 John 2:8). The infant Messiah, beheld and blessed by Simeon and Anna, grew to manhood and went to the cross for our sake. 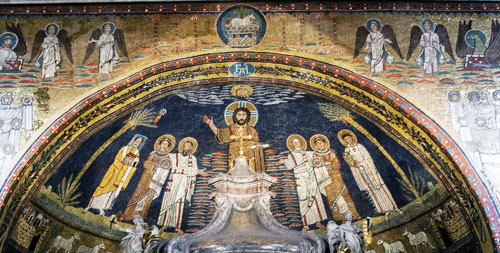 Forty days after His resurrection, He ascended to His throne at the right hand of the Father. We are now living in the days of King Jesus the Messiah, Lord of heaven and earth. Of Him, the prophet Isaiah said, “Of the increase of His government and peace there will be no end” (Isaiah 9:7). As you look to a new year, do you hear the promise of God? Do you see the kingdom of God breaking into the world and increasing? Do you behold King Jesus? Do you pray as He taught us, “Kingdom of God, come. Will of God, be done on earth as it is in heaven”? Do you yield yourself to be led by the Spirit of God, that this expectation may come to pass in you? This is the crescendo of the good news the angel of the Lord announced to shepherds on the night Jesus was born. A multitude of angels now appeared in the heavens with this praise. Glory to God in the highest. The highest praises heaven can offer belong to God as He brings forth the fulfillment of the promises He made to Abraham, David and the prophets. God’s gift of the Messiah King, Jesus, is the greatest revelation of His glory. Peace on earth. The coming of Jesus into the world brings the peace, the shalom, of God. It is wholeness, restoration, reconciliation, the mending of rifts between God and man, man and fellow man, man and creation. Among those with whom He is pleased. The coming of Jesus into the world is the pleasure of God revealed. It is this last point that I want to focus on here. The Greek for “pleased” is eudokia. It is used often in the New Testament to speak of God’s pleasure and delight. The angels’ announcement meant that God’s favor and good will were now being made manifest on the objects of His delight. What is it that delights God and who are those with whom He is pleased, who bring Him pleasure? First, it is Jesus Himself that pleases God, not only in His divinity (in which the Father always delighted) but now also in His humanity. When Jesus was baptized by John, identifying with repentant sinners whom He came to save, the voice of the Father came from heaven and said, “You are My beloved Son; in You I am well pleased [eudokeo]” (Luke 3:22). It was repeated again at the mount of transfiguration, where Jesus shone in all His glory and the voice of the Father said, “This is My beloved Son in whom I am well pleased [eudokeo]. Hear Him!” (Matthew 17:5). Eudokeo is the word used when Matthew quotes the prophet Isaiah concerning Messiah and which Matthew applies to Jesus: “Behold! My Servant whom I have chosen, My Beloved in whom My soul is well pleased! I will put My Spirit upon Him, and He will declare justice to the Gentiles” (Matthew 13:18; it is also the word used in the LXX, the ancient Greek translation of the Hebrew Scriptures, in Isaiah 42:1, the passage Matthew cites). Jesus used this same word when He spoke to His disciples about the kingdom: “Do not fear, little flock, for it is your Father’s good pleasure to give you the kingdom” (Luke 12:32). And in His prayer of thanksgiving when the disciples returned rejoicing, having healed the sick, expelled demonic spirits and preached the kingdom of God in Jesus’ name: “I thank You, Father, Lord of heaven and earth, that You have hidden these things from the wise and prudent and revealed them to babes. Even so, Father, for so it seemed good [eudokia] in Your sight” (Luke 10:21). It pleases God to reveal His kingdom to those who simply trust Him. Again and again, it is in Jesus Christ that the pleasure of God is revealed. Paul says that God “predestined us to adoption as sons by Jesus Christ to Himself, according to the good pleasure [eudokia] of His will …having made known to us the mystery of His will, according to His good pleasure [eudokia] which He purposed in Himself.” (Ephesians 1:5, 9). “For it pleased [eudokia] the Father that in Him [Jesus] all the fullness should dwell, and by Him to reconcile all things to Himself, by Him, whether things on earth or things in heaven, having made peace through the blood of His cross” (Colossians 1:19). God is doing a work of faith in us, His power manifesting in us to reveal the glory of King Jesus dwelling within. It is His good pleasure to bring this work to fulfillment in us. It is by faith that we enter into the richness of God’s pleasure. “Without faith it is impossible to please Him, for he who comes to God must believe that He is, and that He is a rewarder of those who diligently seek Him” (Hebrews 11:6). The Greek word for “please” here is not eudokia but euarestio, but it means the same thing. Without faith, it is impossible to please, but believing God and seeking Him with great expectation pleases God greatly. Paul tells us, “Faith comes by hearing, and hearing by the Word of God” (Romans 10:17). So, “since, in the wisdom of God, the world through wisdom did not know God, it pleased [eudokeo] God through the foolishness of the message preached to save those who believe” (1 Corinthians 1:21). It pleases God for us to believe the good news of Jesus the Messiah and, through faith, bring us to restoration and wholeness in Him. The coming of King Jesus into the world reveals the glory of God and the peace of God but also the pleasure of God. On the night of Jesus’ birth, an angel of the Lord appeared to lowly shepherds tending their flocks in a nearby field. The glory of the Lord flooded them with brilliant light. They had never seen anything like this before and it was far beyond anything they could have ever imagined. Good tidings! Great joy! And it would be for all people, even those of low estate and low esteem — like the shepherds. Quite unexpectedly, they now found themselves at the hinge point in the history of the world, and the birth of a king was being heralded to them. In a field. At night. By an angel of the Lord. This was not about just any king, but about the King. The Anointed One promised by God through the prophets long ago. The descendent of David who would sit on his throne and reign forever. This was about Christ the Lord — the Messiah King! Such an exalted King; such a humble entrance into His domain. Wrapped in strips of old cloth and cradled in a feeding trough. That would be the sign to the shepherds. Surely they needed that sign or else they would have been looking in all the wrong places for all the wrong reasons. Expecting to see finery and a royal court in attendance, they would have felt very much out of place. The angels were well aware of the glory of God that flooded heaven and filled the earth (Isaiah 6:3), but now they were witnessing the announcement of good news and redemption entering the world. It is something that, as Peter says, the angels of God eagerly desire to look into, stooping down and craning their necks, as it were, to gaze upon this great mystery (1 Peter 1:12). What they had greatly anticipated was now being realized, and they were in awe. At the birth of Jesus the Messiah King, shepherds trembled in unexpected wonder and angels stooped deeply in awe. So far in this prophetic song, Isaiah has spoken of the dawn of a great light in the midst of darkness (see His Coming Brings Light), the enlargement of the nation of Israel, ecstatic joy like that of the harvest and of portioning out the spoils of victorious battle. He has sung of the yoke being shattered, the burden being destroyed, and the rod of the oppressor being broken (see His Coming Brings Increase and Joy). It is this Messiah King of which Isaiah now sings. For the government will rest upon His shoulders and to Him will be given dominion — a kingdom. He is called by a series of titles, all of which emphasize His divinity. Wonderful. The Hebrew word refers to miracles that distinguish Him from all others and inspire wonder. Messiah would not only work wonders but would Himself be a wonder. Counselor. This speaks of great wisdom and purpose, and the ability to guide His people with divine counsel. Mighty God. He does not come as merely a divine-like being but as the one true God, as this name indicates elsewhere in Scripture (see Deuteronomy 10:17; Jeremiah 32:8; Nehemiah 9:32; and especially, because it is so close in context, Isaiah 10:21). It is a name that indicates divine power and strength. Everlasting Father, or Father of Eternity. As such, He will not decline, as other kings must, but will rule and reign forever. Prince of Peace. His reign is one that brings peace (Hebrew, shalom). This is prosperity of every kind and wholeness in every way. Isaiah now turns our attention to the kingdom of this eternal King. The Holman Christian Standard Bible renders it this way: “The dominion will be vast and its prosperity will never end.” The reign of God’s Messiah King will increase until His glory is revealed in all the earth, and every nation of the world will experience the peace and prosperity of His dominion. This was God’s plan in choosing Abraham in the first place, and making of Him a great nation. And this was His purpose in choosing David, a “man after My own heart,” to be its king. This divine plan is now in the process of being fulfilled in the reign of King Jesus, son of David and son of Abraham, to redeem humanity, restore all of creation and accomplish the mandate God gave Adam to “be fruitful and multiply,” “fill the earth and subdue it,” and “have dominion” (Genesis 1:28). He is now establishing and enlarging His kingdom throughout the earth. It is a kingdom of justice and rightness that will last forever. Though it has not yet come in all its fullness, this kingdom is already breaking into the world and it will be complete when the King comes again. Just as Jesus first entered the world as a child but then grew up into His destiny, likewise, His kingdom starts small but continues to grow until it will one day fill the earth. For it is the zeal of the LORD of Hosts, the intense desire and purpose of God, to bring it through to completeness. 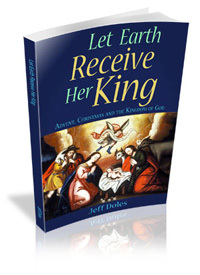 The coming of King Jesus the Messiah brings the dominion of God into all the world. The prophet Isaiah has slipped into prophetic poetry (beginning in verse 2; see His Coming Brings Light). It was not the song the people in his own day were singing but one that would arise in the northern and southern territory of Galilee. It is cast in a prophetic tense, and that he sings it as though it were already accomplished demonstrates the surety that it would come to pass. Then sitting down to teach, He announced, “Today this Scripture is fulfilled in your hearing” (Luke 4:17-22). It was the kingdom of God breaking into the world. Not all at once and in all its fullness, but as a seed that has been growing and expanding ever since. All this the prophet foretold would begin in Galilee, in the circle of the nations. For as Isaiah 9:6-7 will go on to show, it is not only for Israel’s, but for all the nations of the earth (see His Coming Brings Divine Dominion). The coming of King Jesus the Messiah into the world brings abundance of blessing and ecstatic joy. Zebulun was in lower portion of Galilee and Naphtali in the upper. But both were overshadowed, oppressed by the Syrians and Phoenicians and corrupted by their ways. The “way of the sea” was the region of the Sea of Galilee. “Galilee” comes from a Hebrew word that means “circle.” These tribes were surrounded, encircled by the nations in upper Galilee. However, the light of Yahweh would once again break through the darkness and shine brightly in this region. After a long night, a new dawn would come. Matthew finds this new dawn in the ministry of Jesus. However, it was not just the dawning of Jesus’ ministry, but the kingdom of God arising in the earth, now present in the person of the King. The coming of King Jesus the Messiah into the world brings a light that reveals the glory of God to all the nations of the earth. This, of course, is from that hearty old English carol, “God Rest You Merry, Gentlemen.” It speaks not only of comfort, but also of joy and merriment, just as the Gospel does, the good news that King Jesus has come into the world. David knew Him as “The LORD My Shepherd” and drew great comfort from the assurance that His rod and staff were always present to protect and guide (Psalm 23:1, 4). In the New Testament, He is revealed in King Jesus the Messiah, who said of Himself, “I am the Good Shepherd. The Good Shepherd gives His life for the sheep” (John 10:11). But also great joy. On the night of Jesus’ birth, the angels announced to shepherds in a nearby field “good tidings of great joy which shall be to all people” (Luke 2:10). The shepherds came glorifying and praising God for this marvelous news (v. 20). Likewise, when the wise men, seeing that the star which guided them on their quest came to its rest over the place where the young Child was, they “rejoiced with exceeding great joy” (Matthew 2:10) — joy without limit. The apostle Paul spoke of the kingdom of God, the one Jesus announced was now present in the world, the one over which Jesus now ruled and reigned at the right hand of the Father, as a kingdom of joy: “The kingdom of God is not eating and drinking, but righteousness and peace and joy in the Holy Spirit” (Romans 14:17). And he offered this benediction: “Now may the God of hope fill you with all joy and peace in believing, that you may abound in hope by the power of the Holy Spirit” (Romans 15:13). That which was from the beginning, which we have heard, which we have seen with our eyes, which we have looked upon, and our hands have handled, concerning the Word of life — the life was manifested, and we have seen, and bear witness, and declare to you that eternal life which was with the Father and was manifested to us — that which we have seen and heard we declare to you, that you also may have fellowship with us; and truly our fellowship is with the Father and with His Son Jesus Christ. And these things we write to you that your joy may be full. Not only because Jesus has rescued us from satan’s power — and indeed, as John notes, “For this purpose the Son of God was manifested, that He might destroy the works of the devil” (1 John 3:8) — but more than that, because it is in Jesus the Messiah that we have fellowship with God. God rest you merry in this Advent and Christmas season. You can listen to a bit of this carol as well as the other songs from our Christmas album here. Available at Amazon for immediate download in MP3. You can also order it as a CD. We have also put together a little PDF booklet with song lyrics and CD info, which you can download here. That’s a line from a traditional Christmas carol of the West Indies, “The Virgin Mary Had a Baby Boy.” We include that song in our Christmas project. 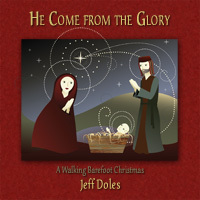 In fact, we named our Christmas album after it: He Come from the Glory. Jesus came down here from the kingdom of glory, the kingdom of God. But He did not just come down to us from that glory and kingdom; He came with them, bringing them to us. Indeed, He came as the king of that kingdom. The more I study the Gospel, the more I see that it is the good news about the kingdom of God, the rule and reign of God through Jesus the Messiah King. That is why, when Jesus grew up and began His ministry, He said, “The time is fulfilled and the kingdom of God is at hand. Repent and believe the gospel” (Mark 1:15; see The Gospel Jesus Preached). Every promise and prophecy of the Hebrew Scriptures converged on this, the coming of the King with His kingdom (see The Gospel of the King and The Gospel of God’s Messiah King). “Waste places” refers to what has been laid to ruin. What once was abundance has now become desolate, a waste land. This is what happened in the beginning, in the Garden of Eden, when man rebelled against God. Adam unplugged from the life of God, and in so doing, brought the world into a state of ruin. Likewise, Israel, by her idolatry and spiritual adultery, defiled the land and brought ruin upon it. “Wilderness” refers to that which is untamed. Barren desert land that has not been cultivated. In the beginning, the Garden of Eden was only a small portion of the earth. God’s plan was for man to extend the boundaries and make all the world a garden of “pleasure” (the Hebrew word “eden” means “pleasure”). God’s plan for Israel was that they would bring His salvation and redemption into all the earth. He said to them, “You shall be to Me a kingdom of priests and a holy nation” (Exodus 19:6). The function of priests is to intercede. As a kingdom of priests, Israel was to be a mediator between God and all the nations of the world, to extend the boundaries of His blessing everywhere. But again, like Adam and Eve, Israel failed because of her rebellion against God. However, God did not cease from His plan. He promised that there would be a comfort, a consolation for Israel and all her waste places. It was a promise not only of restoration but also of fulfillment. God would once again bring Israel into her destiny. The Garden of Eden would once again be established — and enlarged to include all the nations. God would bring His light and justice to the peoples, the nations. Even the far off lands would look to Him in patient expectation, and they would trust in Him. As Isaiah observed so many years ago, it is a cause of comfort and joy, gladness and thanksgiving. What God has started out to do in the beginning, He is now in the process of bringing through to completion in the reign of King Jesus. It is more than appropriate that the season of Thanksgiving leads us into the season of Advent and Christmas, pointing us toward the source of true comfort and joy. The Hebrew word for “awaiting” literally means “silence.” As it is used here, it signifies the stillness of anticipation and yieldedness to the God of Zion. “Vows” are the dedications and commitments made to God. Zion’s God is called, “Hearer of Prayer” (Hebrew, shama tephillah). Not as one who hears idly or indifferently. Rather, what is implied is that God hears with great regard and answers the prayers of all those who come to Him. It is for this reason, when word of it gets out, that all humanity will come before Him and, finding Him to be the Hearer of Prayer, will commit themselves to Him without reserve. Does it sound naïve today to think that all humanity will come to Yahweh, God of Zion, when there is so much conflict in the world against the people of Yahweh? Yet back when this psalm was written, the situation was considerably worse. The surrounding nations were exceedingly vicious towards Israel. But God’s plan all along has been to reach out to the nations through the descendents of Abraham and bring His goodness, His salvation, His shalom into all the earth. Jesus was passionate for this cause. It was why He cleared the moneychangers out of the court of the Temple that was reserved for the Gentiles (the nations) to come and worship the Lord. “Is it not written, ‘My house shall be called a house of prayer for all nations’? But you have made it a ‘den of thieves’” (Mark 11:17). And now there is a new temple, one not made of dead stones but of living flesh, not made by human hands but by the hand of hand of God. The time is coming, and already is, when all flesh will come to the God of Zion. From every tribe and tongue and nation, they will come in faith to the Hearer of Prayer, to be discipled as kings and priests before Him. True prosperity does not come from outside us. It arises from within. It begins as delight in the Lord and in His ways, His instruction (torah, the Hebrew word for “law” can just as well be translated as “instruction”). That is, it starts as an attitude, an orientation of the heart. It grows and develops by giving diligent attention to the Lord and His instruction. In other words, it is a matter of the soul, the inner being. God is big on that. Indeed, He promised that He would make a new covenant with us in which He would internalize His ways in our hearts. More than that, He promised He would give us His Spirit, the Holy Spirit, so that we would not only be able to understand His ways but also to do them. Beloved, I prayer that you may prosper in all things and be in health, just as your soul prospers. When we are out of joint with God, we are out of joint with ourselves, with others and with creation as well. But as we turn to Him, we come into proper alignment. Jesus said, “Seek first the kingdom of God and His righteousness, and all these things shall be added to you” (Matthew 6:33). The kingdom of God is His rule and reign; His righteousness is the rightness of His way of doing and being. When this becomes our priority, everything else will be taken care of itself. This is the prosperity of soul that prepares us for prosperity in all things. Prosperity of soul is the soul of prosperity. Here is the algebra of our inheritance. Yes, we have a good inheritance. We are heirs of all things. God’s plan, ever since Adam plunged creation under the curse through rebellion against Him, has always been to redeem the world and its inhabitants. For “the earth is the Lord’s, and all its fullness, the world and those who dwell therein” (Psalm 24:1). To this end, God chose Abraham and made him a promise: “In you all the nations shall be blessed” (Galatians 3:8; see The Gospel of Abraham). He confirmed this to Abraham’s son, Isaac, and to Isaac’s son, Jacob (see The Gospel of the King). Through Jacob, He created a nation, Israel, that they might be a priestly people. “You shall be to Me a kingdom of priests and a holy nation” (Exodus 19:6). The purpose of a priest is to act as mediator between God and the people, to represent God to the people and the people to God. The purpose of a priestly nation is to represent God to the nations and the nations to God. God’s covenant with Israel was never just for Israel’s sake, but for the sake of the whole world, all the families of the earth — the nations. This is not about a physical temple but an enduring kingdom, the rule and reign of God on the earth, which cannot be shaken. It is no longer just a future hope but a present reality. Though it has not yet been fully realized, it has already begun, for we are now receiving it (present continuous action). God’s plan to restore the world and set everything right is fulfilled in Jesus the Messiah, who now reigns as King over all. He is calling the nations to embrace His divine kingdom, become part of His living temple, enjoy the glory and goodness of His house and experience the fullness of God’s shalom — peace and wholeness. There is a new creation coming. It is not a another creation or a different creation but a renewal of creation. God never gave up on the first as a failed creation. Adam rebelled in the Garden of Eden and by doing so, as God’s representative king on the earth, plunged all creation under a curse. But God never set it aside. Instead, He made a way to redeem it. This plan reached its climax in Jesus Christ, God and Man joined together in one person, who is called the Last Adam (1 Corinthians 15:45). At the cross, He defeated the powers of darkness, the devil and all his works (Hebrews 2:14; 1 John 3:8), then was raised by God the Father as the “firstborn from the dead” (Colossians 1:18). It was through the Son of God that the first creation came into existence; it is through the Son also that the renewal of all creation has now begun. The bodily resurrection of Jesus the Messiah from the dead is the guarantee that all creation shall be renewed. For all authority in heaven and earth has been given to Him (Matthew 28:18), and He rules and reigns as Lord of all, not as a divine but disembodied spirit but as the eternal God/Man who is forever embodied in the stuff of creation. When He comes again, the heavens and the earth will be made new (Revelation 21:1) and “we shall be like Him, for we shall see Him as He is” (1 John 3:2).